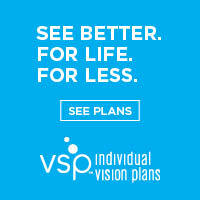 VSP Individual Vision Plan, Same Day Enrollment is now available. Click the VSP link above for more details. Understanding the differences between Vision vs. Medical Insurance is one of the most confusing issues patients face in any optometrist's office. Vision insurance is designed to only cover updates in glasses and contact lens prescriptions and a health wellness screening. There may also be benefits for glasses and/or contact lenses products. Medical Insurance covers the diagnosis, treatment and management of conditions in the eye such as allergies, dryness, infections, cataracts, macular degeneration, diabetic retinopathy, glaucoma, floaters or headaches. Unfortunately, due to the rules of your insurance company, we often have to bring patients back for a separate visit from their annual wellness exam to treat their medical concerns. Please let us know what your primary concern is for your visit so we can help you maximize your benefits and obtain the correct insurance information.